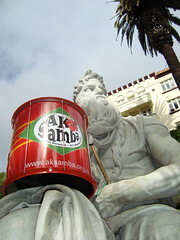 AKSamba is an innovative world percussion band based in Auckland, Aotearoa New Zealand. Our musical style is a fusion of hot Brazilian rhythms (such as samba, samba-reggae, coco, baião) with drum & bass, hip-hop and other dance influences. The band was founded in 2002 and performs with up to 40 members. We aim to create an unusual, extraordinary, awesome musical experience! We also regularly offer training courses and workshops in samba percussion. We practice every Monday from 7.00pm–9.00pm at the Auckland Bowling Club, Grafton Mews (off Stanley Street) in central Auckland. Everyone is welcome to come and observe. Drop us an email if you plan to turn up so that we know to expect you and can tell you if there are any time or venue changes. You will also need to bring earplugs.